Increase the sales floor and back of house area. Extension of the car park into raised ground requiring retaining walls. Design retaining structures to meet public highway standards. The store extension is of steel framed construction and is supported on strip and pad foundations with a ground bearing floor slab. The relocated road was at a higher level requiring reinforced concrete retaining walls designed for vehicular impact due to its close proximity to the public highway. 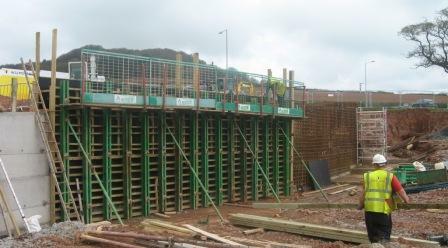 The existing timber crib retaining wall was also extended around sections of the new car park.